Goats and a park swing to promote safety. Murals and a time capsule to celebrate a bicentennial birthday. A mosaic mural and braille cooking classes to encourage inclusion. These are all projects funded by the first three rounds of Creative Community Grants from The Center for Great Neighborhoods (The Center). The Center is pleased to announce the fourth round of Creative Community Grant recipients. 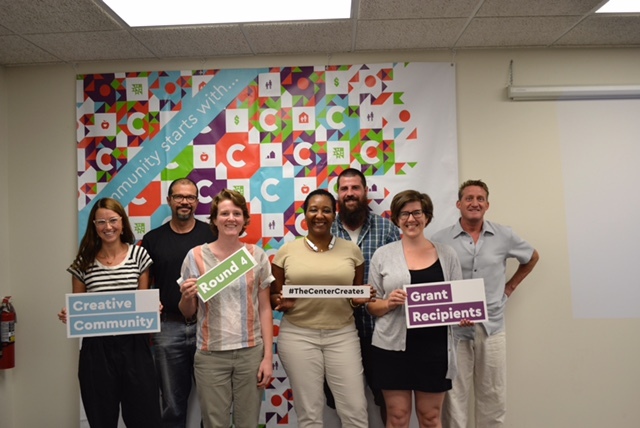 Grants totaling $30,000 were awarded to seven artists and creatives who proposed unique projects designed to positively engage and impact the Covington community through art. In this round of grants, the projects all focused on the topic of health. Grantees were selected by a panel of five judges that included professionals in arts-related organizations, Covington residents, and a staff person from The Center. Bi-Okoto is a cultural institution that shares and promotes African heritage through cultural experiences. With this grant, Bi-Okoto will provide access to the B-FIT with Bi-Okoto classes in the City Heights community. B-FIT with Bi-Okoto classes are fun and interactive ways to move into a healthy lifestyle by introducing specifically youth and teens to culturally inspired dance fitness. They will be motivated to participate in physical activities through fun dance fitness routines to increase their cardio, strength, endurance and flexibility with creative goals that enhance their self-esteem, character development using strategic challenges, nutrition tips and rewards. Artist, sculptor, and metalworker, David Rice, will build the world’s first bicycle powered stereoscopic kaleidoscope. The aim of this kinetic and interactive sculpture is to encourage physical activity more often and for longer intervals by captivating the participant with the synergy of light, color, shape, and motion that they actualize by exercising. David will work with students in The Center’s summer BLOCK program to gather the materials and construct the colorful inner workings of the kaleidoscope. Kids Cook Too! is an afterschool cooking class that makes eating healthy creative and fun. Students will get the skills, knowledge and experience they need to plan and cook their own nutritious meals and snacks, empowering them to take their health into their own hands. They’ll also learn how to find fresh produce and healthy food options in their own neighborhood, and create their own maps they can use to help teach others and raise awareness around disparities in food access and availability. The purpose of this project is to make creative and healthy amenity improvements at Goebel Pool in Mainstrasse Village, to make the pool an attractive destination that encourages residents to come, stay, play, and enjoy an afternoon with their family. The City has committed to matching the funds for this grant to make sure that pool improvements include: large shade structures, picnic tables with umbrellas, paint for the pool house, and some artistic installations, designed by Make Goebel Great and created and installed by the community. Caroline Creaghead used to run behind the scenes operations for live stand-up comedy shows before turning her focus from the business of comedy to the comedy of business. This podcast will address the frustrating and funny parts of living as a working artist. Not as an advice show, but as a refreshingly honest and entertaining discussion about the taboo topic of money. This grant will fund six episodes, each featuring a Covington-based artist who is open to discussing their business like they’re talking to a friend. Over the span of two days at the Hellmann Creative Center, Luis Laya and James Payne will help strengthen the Covington community with a cultural culinary experience. What’s a better way to get to know your neighbor than to share a meal with them? Luis and James, two artists from Cincinnati, will create an event centered around building community through entertainment and educational cooking techniques involving open fire and the use of custom fabricated grills created by the two artists. Focusing on culinary health and educating the community on different cultural styles of cooking James and Luis strive to find our own cultural identity by embracing the rituals of cooking and eating as a community. The Center partnered with the Kenton County Extension Office, local Westside artists, and contracted with Annie Brown to run a free day camp for elementary aged kids. The camp was held over three days and specifically timed it to take place between the end of the school year and the start of the summer programs run by CIPS. The kids learned about nutrition, exercise, gardening, composting, did yoga, made healthy popsicles, and lots of other creative projects. The Center plans to continue awarding Creative Community Grants in two more rounds over the next year. Awards of up to $5,000 per project will be available and each round will address a different community identified issue or topic. Information on the next round of Creative Community Grants will be available in the fall of 2016. More information about Creative Community Grants can be found online at www.greatneighborhoods.org.